You're very welcome Shalimar. I've been reading your various blogs for years and miss your Athens posts. Logia Tis Ploris is a new restaurant and I have no doubt that it will be a success. We ate there two days in a row and would be happy to eat there again and again. It is worth going there for the food alone, but the owners are also very nice and if you order a miso kilo of wine, they keep refilling it without charge -- a sign of their wonderful hospitality. 2. Taking fresh eggplant, shelling it (ridding it of the flesh), and freezing it immediately; I make yemista in the winter with it (without defrosting, just fill the frozen shell with the rice mix), and believe me, it is delicious. 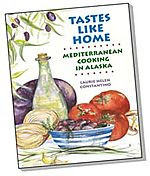 Hi Maria, the problem is that eggplant doesn't grow in Alaska - the growing season just isn't long enough. 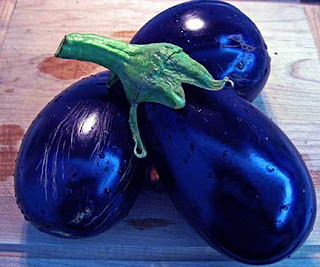 Luckily, we are always in Greece during September, which is the height of eggplant season! PS: I have also roasted eggplant on the grill and then frozen them. The thawed, grilled eggplant are perfect for melitzanosalata.